The KCC23SS is a curved undermount single bowl sink in stainless steel. It is corrosion and rust resistant to withstand tough use in the kitchen and its finish and design are both elegant and sleek, complementing your modern kitchen perfectly. The KCC24SS is a curved corner, rectangular single bowl sink in stainless steel. It is corrosion and rust resistant to withstand tough use in the kitchen and its finish and design are both elegant and sleek, complementing your modern kitchen perfectly. 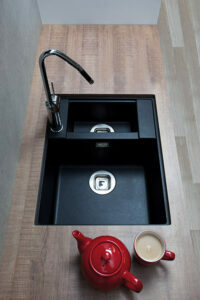 The KMG24BL is a single bowl composite sink in anthracite. It is made from a virtually indestructible granite-quartz construction, it is tough, stylish, heat resistant and hygienic. You can also choose whether you prefer installation to be on top or below the worktop surface. 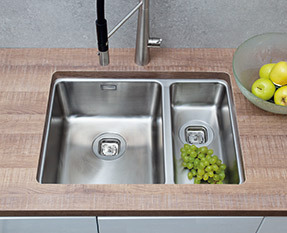 The KMG24GR is a single bowl composite sink in graphite. It is made from a virtually indestructible granite-quartz construction, it is tough, stylish, heat resistant and hygienic. You can also choose whether you prefer installation to be on top or below the worktop surface. The KSC21SS is a half bowl undermount sink in stainless steel. It is corrosion and rust resistant to withstand tough use in the kitchen and its finish and design are both elegant and sleek, complementing your modern kitchen perfectly. The KSC23SS is a single bowl, square undermount sink in stainless steel. It is corrosion and rust resistant to withstand tough use in the kitchen and its finish and design are both elegant and sleek, complementing your modern kitchen perfectly. The KSC24SS is a square single bowl, undermount sink in stainless steel. It is corrosion and rust resistant to withstand tough use in the kitchen and its finish and design are both elegant and sleek, complementing your modern kitchen perfectly. The KSC25SS is a square cut, single bowl undermount sink in stainless steel. It is corrosion and rust resistant to withstand tough use in the kitchen and its finish and design are both elegant and sleek, complementing your modern kitchen perfectly. The KVC35RSS is a stainless steel undermount one and a half bowl sink. It is designed to be installed below the level of your worktop, allowing an uninterrupted flow throughout the kitchen worksurface. If you are looking for something a little more streamlined, then an undermount sink is the way to go. You can still have the option of steel, ceramic or composite and you needn’t compromise on size either, with one and a half bowl sizes available. If you are still wondering exactly what an undermount sink is then our undermount sink guide is definitely worth a read. This guide explains what they are, what they are good for, where they look great and what to do with them. In a nutshell they are great for sweeping crumbs and dirt straight into the sink bowl without them getting caught on a sink edge. They provide a seamless and uninterrupted line throughout your kitchen. It is worth considering whether you need a separate draining board as you won’t get one with an undermount sink model. These are installed below the worktop level so do not have this feature. Undermounts are available in ceramic, composite and stainless steel so you will not have to compromise on your favourite material for the style. Click here to discover which sink material suits you best and will perform brilliantly in your unique home. We have undermount models in a slim single bowl design that are ideal for island units and extra drainage space, large sizes that replace the same bowl size as your normal overmount sink and bowl and a half designs that come in either a left or right-handed style to suit the way you work perfectly. 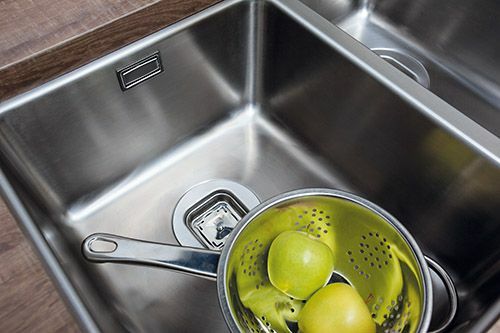 Depending on your style you might be looking for a rounder or squarer sink design. If you have spent a long time choosing handles and lighting to match then your sink should definitely fit in with the rest of the styling too. Rest assured that we only use the highest grade of materials in our undermount sink range from the hand fired ceramic clay that is unique and beautiful in style, the virtually indestructible composite to the corrosion and rust-resistant stainless steel that is so practical in style. It is vital that you seek professional installation assistance with an undermount sink. It is important to ensure that the worktop is cut to precision without error and that a perfect seal is created around the sink to prevent leaks and wet cupboards beneath. You can really go for any style of tap with an undermount sink but the low profile styling is the perfect situation in which to show off a sculptural design and make a proud statement with your tap. Take a look at our designer taps for inspiration. Undermount sinks are still compatible with our space saver plumbing packs for convenient installation and saving on cupboard space. You could also consider a waster disposer unit to conveniently get rid of organic waste in the kitchen quickly and easily. Our entire sink range comes with an easy fixing kit to get you going as quickly as possible, a range of stylish and practical optional accessories to choose from as well as a CDA guarantee for peace of mind.